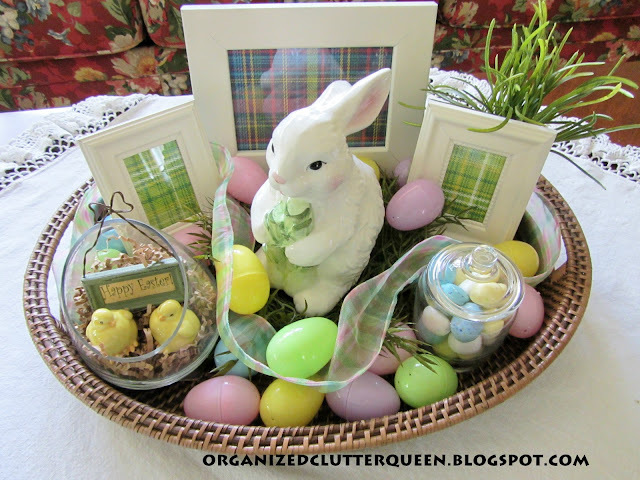 My second entry in the "Tartan Parade" is an Easter plaid themed basket vignette. 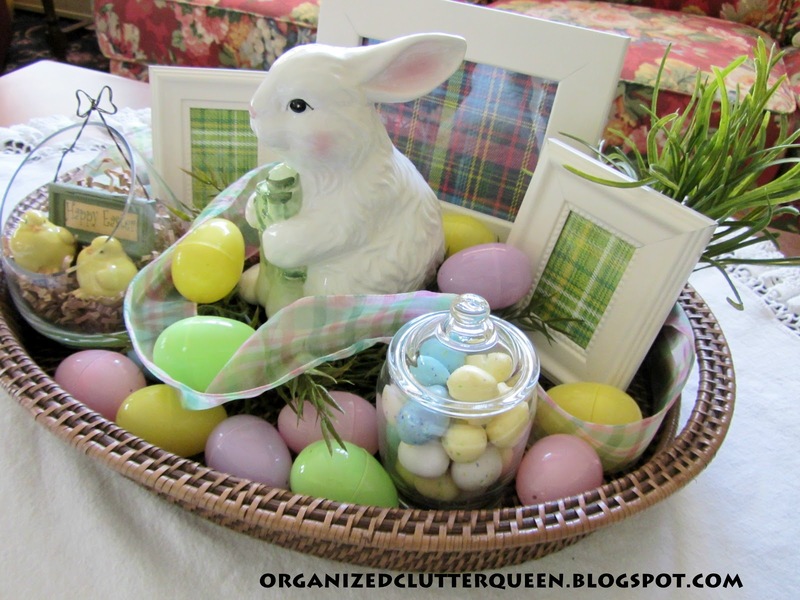 More of my "Tartan" creative license was used here. Just YESTERDAY, I picked up two scrapbook pages at Ben Franklin in pastel plaids, and decided to frame them. I had one clearance wood, green painted frame from Ben Franklin in a drawer and two gold Dollar Store frames that I spray painted heirloom white this morning. I used the oval, tray basket I had purchased last weekend in the Twin Cities at Target. 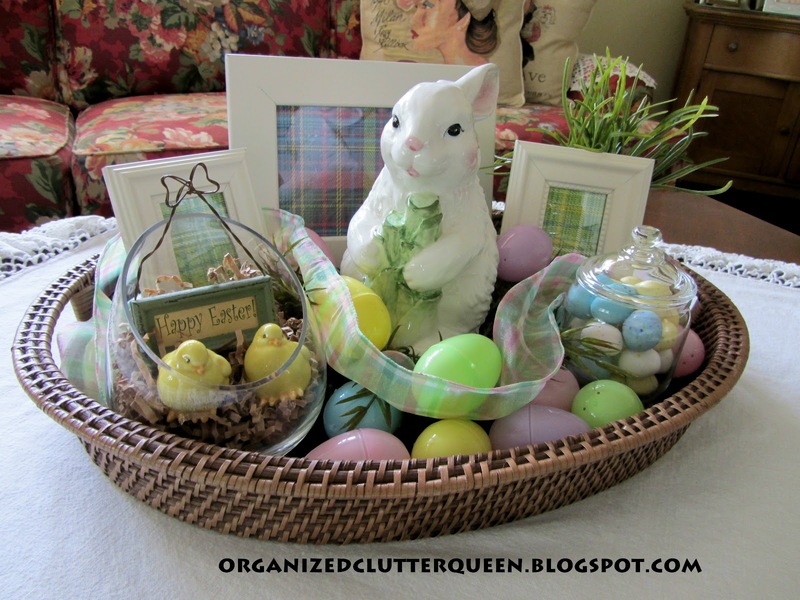 I added my grassy candle wreath in the center, a ceramic bunny purchased locally at a consignment shop, a jar of malted Dollar Store Eggs, a glass vase with shredded brown paper grass and two chick, ceramic figurines and a "Happy Easter" sign from the Tattered Angel (also YESTERDAY), a potted grass, a plaid ribbon, and plastic pastel eggs from Kmart. Does this qualify as a tartan parade entry? 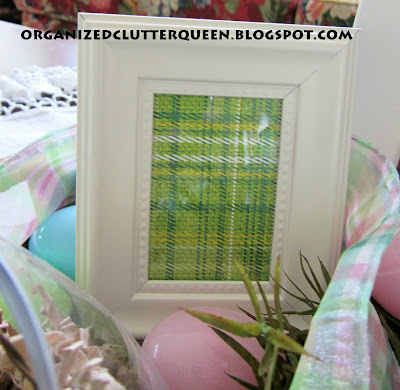 Dollar Store gold frame with another scrapbook page plaid. 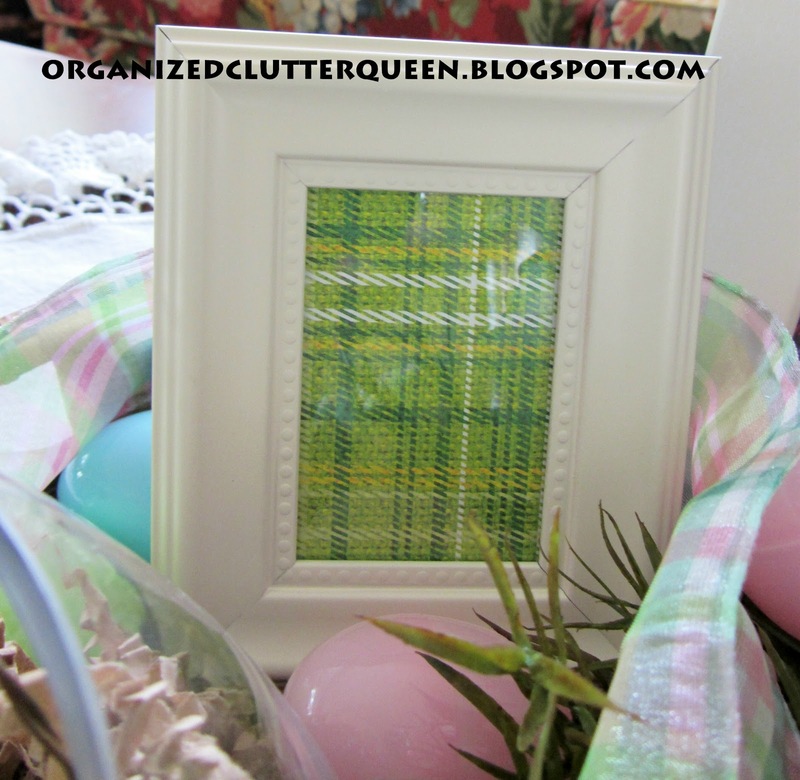 The other Dollar Store frame with green plaid paper. 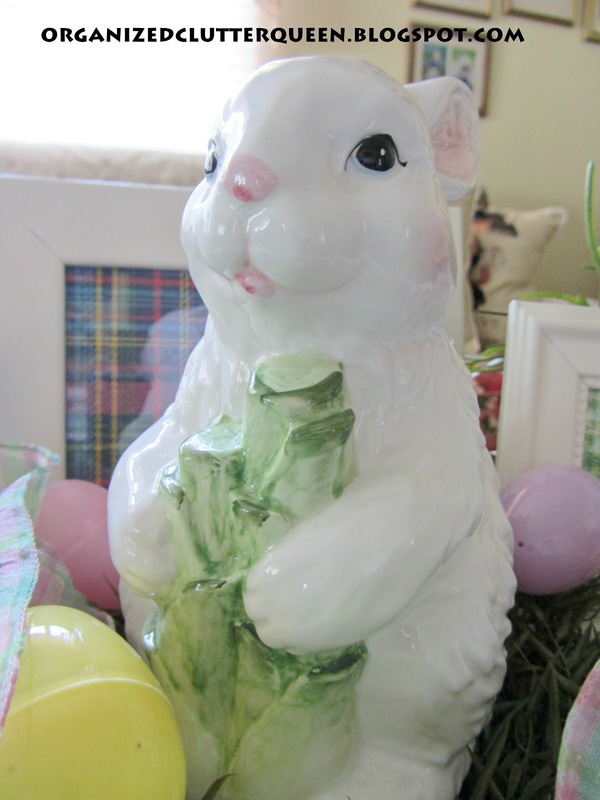 My consignment store ceramic bunny figurine. 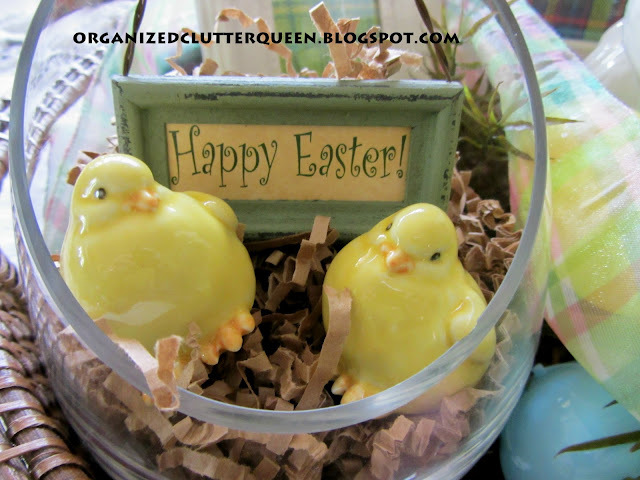 In a glass vase/rose bowl, shredded brown paper, two ceramic chicks and sign. 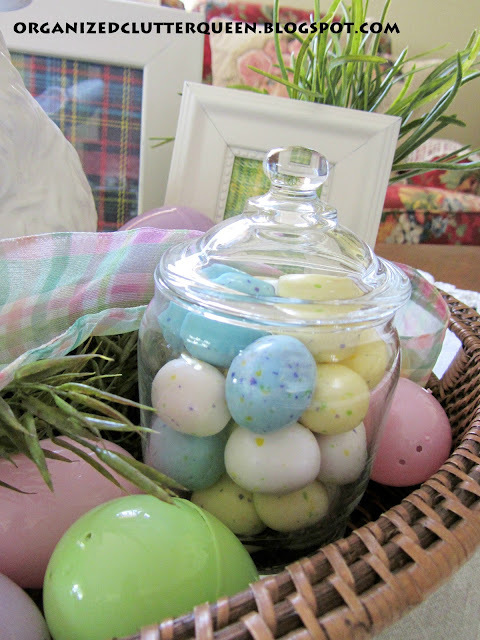 Malted milk eggs in a covered jar. 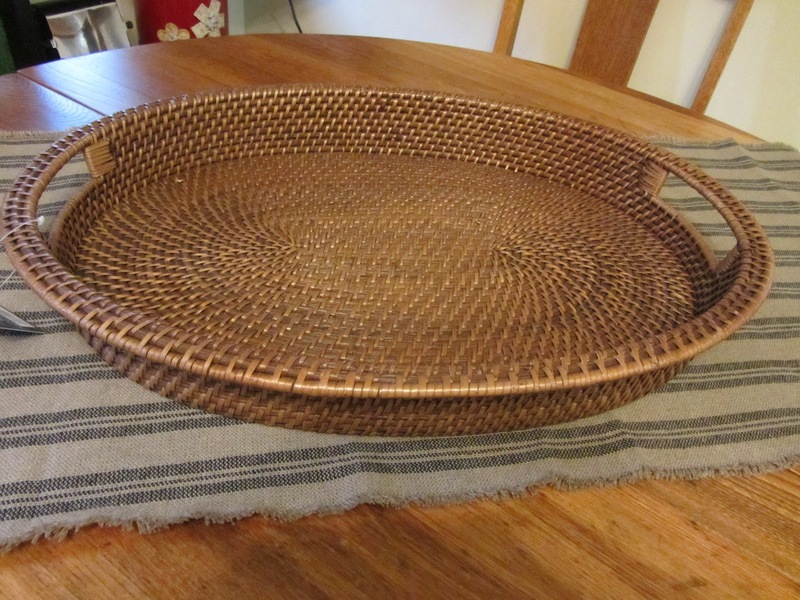 An above photograph of the basket on my coffee table. 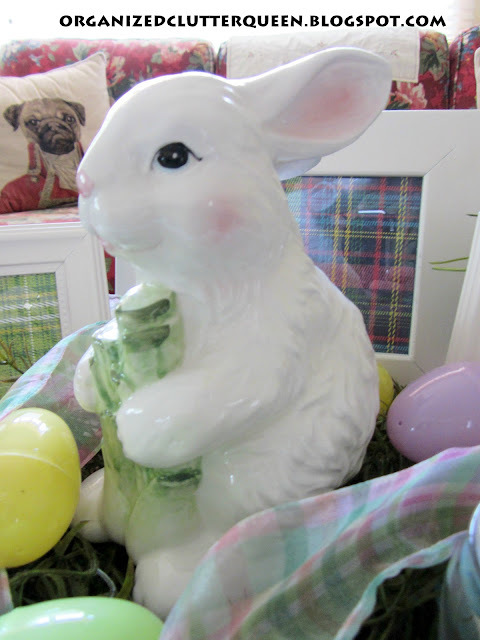 What is really a coincidence is that my blog mentor (and first follower), Babs, (Upstairs, Downstairs blog) also had an Easter plaid post theme for the Tartan Parade. I didn't know about her post, and she didn't know about this one! I hope you like it, Babs! The addition of that heirloom white paint to those Dollar Store frames makes all the difference in the world! I will have to take my cue from you on that one! I think this TOTALLY qualifies as a Tartan Parade entry! Very imaginative and, like Sarah said, there's no written rule that confines the beauty of plaid to Christmas! Have a wonderful weekend! Carlene..OMGosh..great minds think alike! :) I LOVE it!!! and it just proves that tartan is perfect year 'round. What a great way to display the tartan patterns in the white frames. 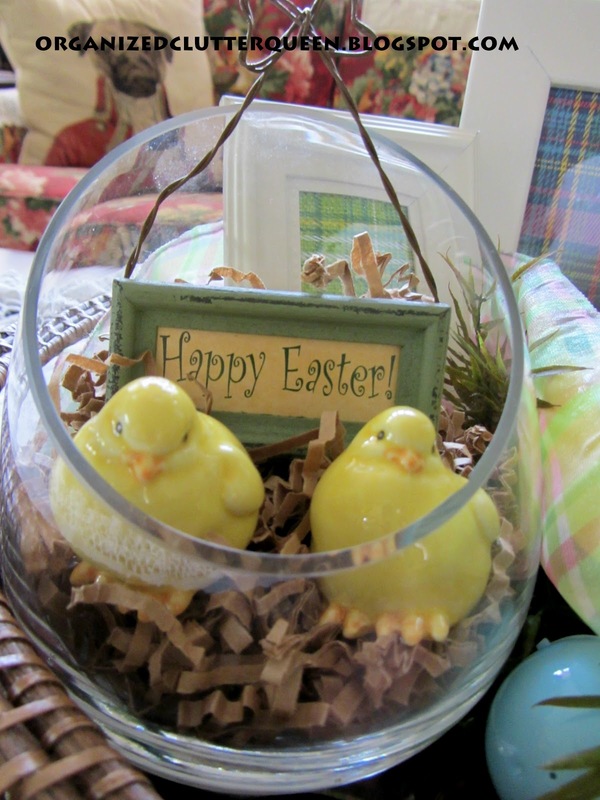 The little chicks in the glass vase are so cute. 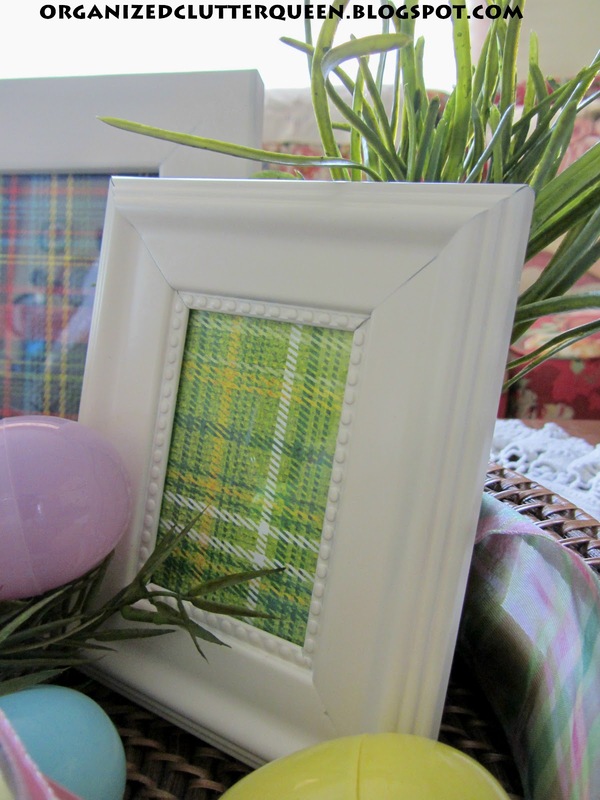 It's all perfect for Tartan Day, and Easter. Thanks for joining the Tartan Parade and for your sweet comments. I did not know Babs was your Fairy Blogmother! I have one too!! This is so sweet and I love all the layers and details. So darn cute! I love the whole collection, and the plaids in frames too. 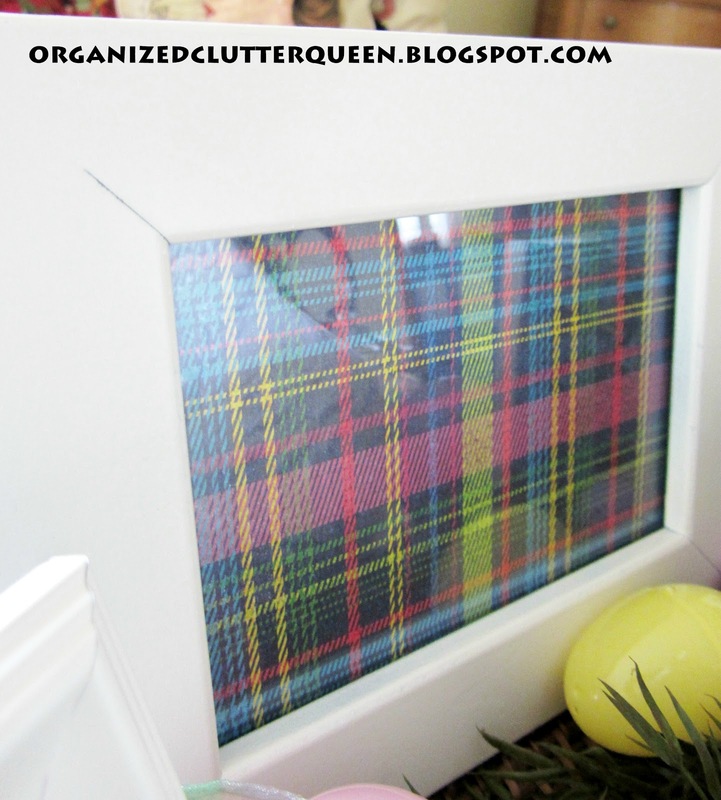 Pretty...I don't believe I have one thing Tartan...but your framed pieces are very nice and springy!! So adorable. Love the bunny. Cute idea to include frames. What a cute display!! I love the plaid! I think the Tartan parade was such a creative party. I have seen so many fun and inspiring posts. Yours is so cute and definitely creative! That is pretty cute! I love the Tartan prints on the white frames! I'm stopping by from BNOTP. Your newest follower.